Ok, something a little different this week - 40k 8th Edition. Now this is only my second game of 40k and no doubt we're getting little things incorrect here and there and as this is a friendly game we're not too fussy! Anyway, army-wise I've always liked the look of the Grey Knights and I've had some lying around for a few years, never really finished painting them so when we decided to have a game it was either them or my Imperial Fists. 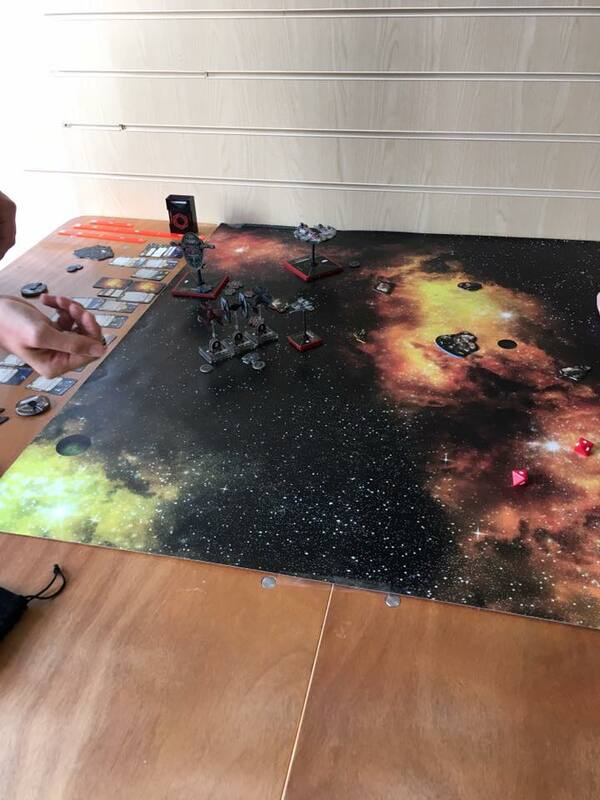 The first game used the Fists but even though I pulled out a win by the skin of my teeth I felt the Grey Knights offered me more choice and as my opponent was using Space Marines as well, it would at least not end up being a clone war! So, we decided to use power values as opposed to points, using everything I had we ended up with 78 power. My opponents force consisted of 3x 10-man Devastator squads, 2x 10-man Tactical squads, a 10-man Scout squad, 2x Captains and a Tech-Marine with a cannon. So with my opponent having rolled for the game type etc, it ended up that I would place first and start first (no idea how, I just went with it). This meant that my opponent would have control of two objectives barring nothing untoward happening, whereas I would have to advance forward as I'd placed my two more centrally on the board. Looking at my opponents placement and knowing I had the initiative for the first turn I had some interesting choices to make. I'd not faced the Techmarine or the Scouts with sniper rifles before so made them a priority target. This would have the added benefit of making the objective obtainable, if not immediately then a turn or two in. 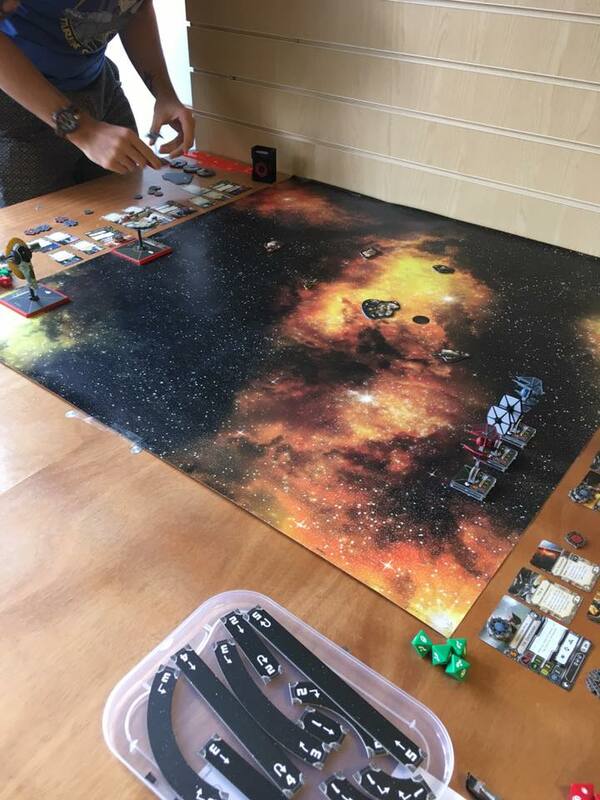 So now it was a case of selecting which units would teleport where... My Interceptors jumped towards the mass of Tactical and Devastators on the right of the picture above. My Dreadknight and Brother-Captain teleported in next to them. On the other side, my Terminators and Grand Master teleported in. During the psychic phase, my Librarian used Gate of Inifnity to teleport my Paladins in, supporting the Grand Master and Terminators. During the rest of this phase, my units used Smite to remove a couple of Scouts and some Tactical Marines. 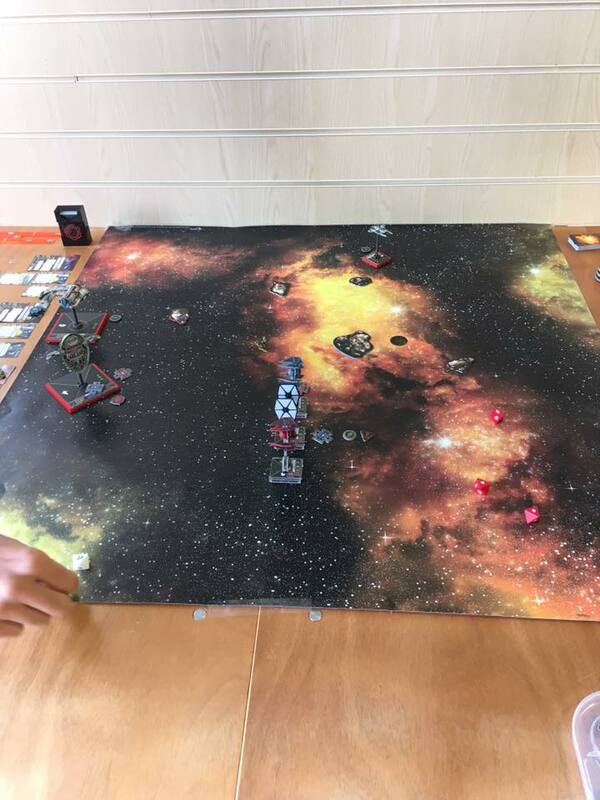 The shooting phase began, with the Interceptor's Storm Bolters decimating the frontmost tactical squad, the Brother-Captain finished them off. The Psilencers killed a few of the Scouts. The Dreadknight had range on the middle Devastator squad and opened up on them, killing most of them. On the left side, the Terminators killed the Techmarine and the Paladins reduced the Scouts to 5-men. The assault phase saw my Interceptors charge the rear-most Devastator squad, the Dreadknight charge the middle Devastator squad and my Paladins succeed in charging the Captain. What followed was an absolute slaughter - the Devastator squad was reduced to just the Sargeant by the Dreadknight, the Interceptors reduced the Devastators to three men (the opposing Captain joined the fray at this point) and lost only three in return. Overall, I was more than suprised as to how effective this round has been for me. Considering how outnumbered I had been, I was now in a decent position. Not much happened in the movement phase at all, during the shooting phase the Scouts and the last Devastator squad managed to kill the Brother-Captain (some really bad rolls did not help me here). In the assault phase, the Scouts rallied to the defence of the Tactical squad against the Paladins but were utterly wiped out by them. On the other side, the Devastators and Captain engaged with the Interceptors reduced them to 2 survivors, in return they managed to kill off the remnants of the Devastator squad. The power fist Sargeant managed to damage the Dreadknight further and the last Devastator squad moved into close combat with the Dreadknight. The hammered it, reducing it to 3 wounds. The Dreadknight finished off the Sargeant but was now in poor shape. So after all was said and done, in turn 1, the Space Marines gained 1 victory point from having uncontested control of one of the objectives. The Interceptors failed thier leadership test so fled the battlefield. The Interceptors were gone along with the Brother-Captain. On the flip side, the Scouts, one Tactical squad, two Devastator squads, one Captain and the Techmarine were gone. My Terminators and Grand Master moved towards the fray, my Librarian moved into range of one of the objectives. During the psychic phase my Grand Master rolled perils of the warp twice, rolling 3 mortal wounds twice, killing himself. Epic fail. The rest of the units Smited for a few kills in total, then during the assault phase the Terminators moved into base contact with the Tactical squad. They then proceeded with the Paladins to wipe them out, consolidating towards the final opposing forces (the last Devastator squad and the Captain). The Dreadknight attacked the Devastator squad, causing little damage. I score 2 vp's and my opponent scores 1, bringing us to 2 each. I move my Teminators and Paladins into close range and open up with everything. I manage to kill some of the marines, during the psychic phase another falls and then I charge in - the Terminators go for the Captain and the Paladins for the last remaining members of the Devastators. The Paladins reduce the Devastators to three men and the Terminators manage to do one wound to the Captain. During the Space Marine turn, the Devastators manage to kill one othe Paladins and wound both of the others. They are finished off in return. The Captain is unable to harm the Terminators... I claim 2 more VPs. The Terminators attack, eventually the Justicar with the Daemon Hammer manages to score the final blow, killing the Captain and winning the day for the Grey Knights! 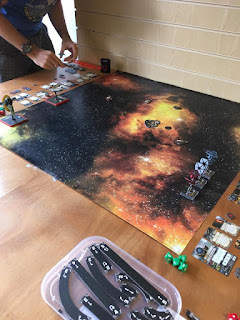 So, final thoughts having discussed some of this with my opponent - the fact I went first and the placement that my opponent used made it so as soon as I managed to get into close-combat I could just keep on consolidating through and steamrolling his forces. If they had been more spread out I would have had a harder time I think. The unit of the game for me were the Interceptors. The speed and the amount of pure firepower and close combat damage they can throw out is horrific. The Dreadknight I probably shouldn't have charged into close combat... In retrospect with the weapon loadout (Gatling Psilencer/Heavy Incinerator) I should have stayed out and used it to throw as many attacks in as possible but live and learn! Epic fail rolling of the day was the Grand Master... two perils in a row and 3 damage each time... unbelievable. We definitely missed out on a few things, both forgetting things that would have helped but we are still learning after all! Anyway, if you've read through all of that, thank you very much & I hoped you enjoyed it! 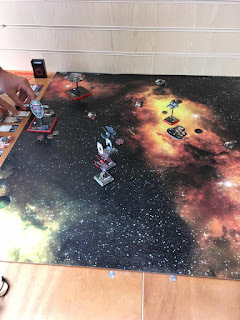 As you may well be aware, my record with X-Wing is not exactly stellar by any means so with great trepidation I headed into this at least wanting to destroy one ship. Just one. Unlike the last time. Where nothing wanted to blow up. At all. Having now run two Rebel lists and a Scum list I wanted to give something different a try - Imperials. Now as far as selection goes I think the problem I'm having overall is that I can't throw enough red dice at things - nothing wants to blow up. So, to counter my awful red dice rolling I've decided to maximise my odds by throwing as many dice as possible - two TIE Defenders with the TIE/D title and ion cannons. So, which ones to take? Countess Ryad is, for me at least, an auto-include. The ability to perform a green k-turn at any speed is just too good to pass up. The second Defender will have to be Vessery - picking up the more or less free target lock added to the focus that I will inevitably take has really good potential to enable me to hit something. The third ship was where the big choice was going to be made. I wanted to take a TIE of some description that could hurt something. In the end I went for "Omega Ace" as it can, in the right circumstances, hurt something. An almost identical list, Tony was using Ryad with a tractor beam and the TIE/D title, Vessery with the TIE/x7 title and Omega Leader. Unfortunately my memory card on my phone had a bit of a pout with me here and it didn't take any of the photos. Hmph. Anyway, it went a little like this - a joust to begin with with neither squadron inflicting a massive amount of damage on the other, but ions being thrown around a bit which managed to get me into position on his Ryad allowing me to finish her off. I then lost Vessary but not before Omega Ace got off the critical effect attack on Omega Leader. Ryad then finished off Vessary for the win. 100 - 38, my first tournament game win in some time! Andre was running Fenn, a Contracted Scout and a Mandalorian Mercenary. Photos this time! Fenn was being placed on the far side of the table in this photo. 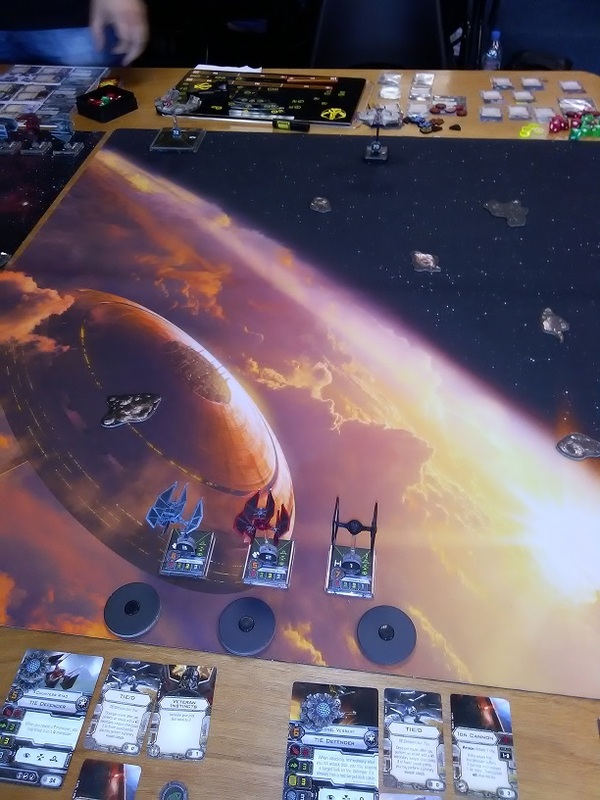 As you can see - I was starting to get Ion tokens on the Firespray at long range, and with Fenn too far out to hit me I knew I had to get it off the board quickly. Another Ion token on the Firespray and I knew exactly where it was going next turn - my best chance to finish it before having to deal with Fenn, who was by now in range and starting to hit Vessery. Shortly afterwards Fenn took a couple of hits but managed to finish off Vessery. 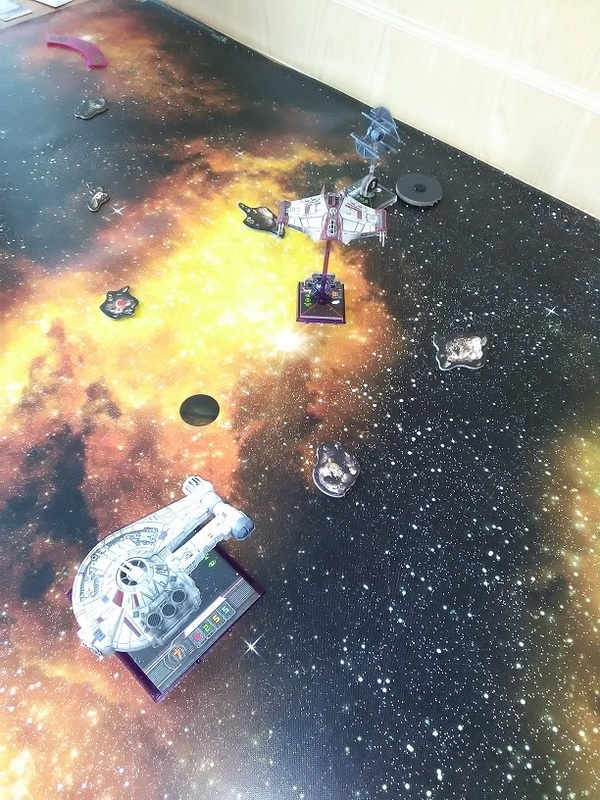 Two turns later, Omega Ace had focussed and target locked the Contracted Scout at range one, using its effect rolled three critical hits on the Scout to take it off the board. Fenn went hunting for Omega Ace but it took time getting behind him and when Omega Ace eventually went down Ryad had managed to get a side-on Ion hit on Fenn, now down to one hull and without a return shot. 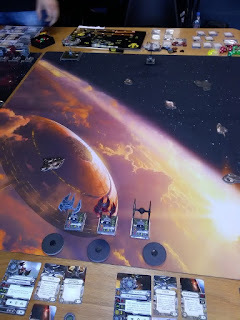 The next turn Ryad had free reign to take on an out of position Fenn - the Ion shot went through eliminating Fenn! My second win of the day, 100-61. Nym kept dropping bomblets and I kept landing on them! I did manage to keep Dash at range one for a few turns but I just couldn't escape the bombs in the end... a loss, 100-0! So, here we go... aim of the day - kill Nym first worry about Dengar later. Joust in, didn't realise Nym had autoblasters and accurancy correcter, three turns in and Omega Ace was gone. In retaliation Ryad and Vessery wiped Nym off the board but Dengar was in position to smash Vessery, taking all his shields off and leaving me in a bad shape. I managed to block Dengar for a turn but an excellent 5 hit shot with torpedos on Ryad basically finished me off in this one. 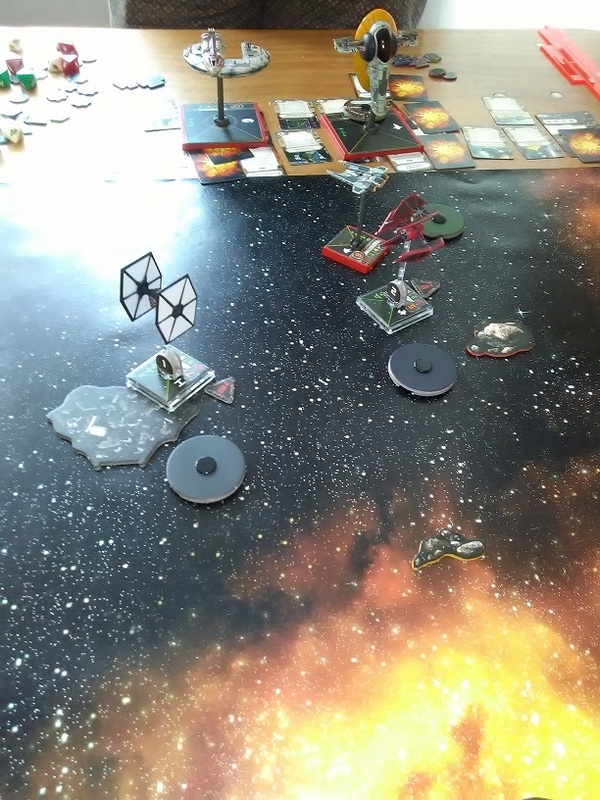 Next turn Ryad was gone and Vessery was running for his life, unfortunately I just couldn't run fast enough or hit hard enough to outfly Dengar - the higher pilot skill made it really difficult to outmanouver and in the end I couldn't get it done. A loss but with half points from Dengar - 100-68. 11th place overall, although postitions 11-6 were all 2-2 on the day, points scored being the decider. I was really happy with my games on the day, with the exception of the third game where some really silly decisions lost me the game before I even started. To sum up, my best X-Wing performance to date and I have found a new favourite ship - the TIE Defender is awesome. Anyway, until next time, hope you enjoyed the read!